1. Center console with a power outlet: this helps remove the temptation of looking at your phone while driving, as you can charge it while it’s out of sight in your console. As an added benefit, your phone won’t go flying through the air if you suddenly have to brake. 2. Rear seat DVD player: a few weeks ago, we wrote about how to entertain kids while on a car trip. If all of our terrific car game suggestions fail you, a DVD system in the back seat can help make a long trip much more pleasant for the whole family. Just make sure you don’t forget the headphones! 3. The foot-operated liftgate: how many times have you needed to open the trunk when your arms were full? Do you prop your foot up on the bumper, and try to balance your bags on your leg while you feel around for the latch? Let’s face it, we all have, and we have all wished there were a simpler way; now there is. With the touchless liftgate, merely placing your foot under the rear bumper while the keyless remote is in your pocket will release the trunk and/or liftgate. 4. Tablet-style center stack control interface: this little gizmo ellimates all those buttons and dials on your center stack, essentially turning the whole thing into a big iPad. 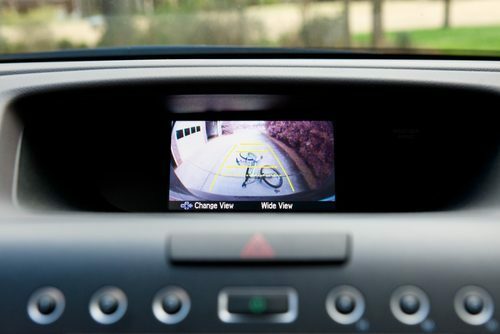 Swipe to turn on the backup camera, tap to adjust the temperature, touch to select your music or browse the Web. This is currently only available in the Tesla Model S, but Cadillac offers something similar, and other manufacturers aren’t far behind. Of course, this is just a quick overview of a few of the features that are now available. If you would like to read more, the article Best New Car Features for 2013 describes some that are truly groundbreaking. Soon, cars will be so automated they will actually drive themselves, and automotive industry insiders predict that these autonomous vehicles may be available as early as 2025. This means that our children will one day ask us about the funny old cars that we had to…drive.